In Wuhan, Hubei Province, before we went to Li Xianyuan’s house we called Mr. Kong Weizhen (孔维真), a disabled man who lives in Hanyang District in Wuhan, inviting him to come to Li Xianyuan’s house. An hour after we arrived at Li Xianyuan’s house, we heard knocks on the door. Mr. Kong had arrived. He is very tall, more than 1.9 meters (6’ 2”) and walks with a cane. His height gives people the impression of an upright man. We can see from his facial expression that he is a down-to-earth and honest man. Upon seeing him, Mrs. Qi Guoxiang, the mother of a June Fourth victim in Wuhan who had accompanied us on our visits in the city, moved a stool over for him and asked him to sit down. She and Mr. Li Xianyuan treat him like a son. She told us that Kong Weizhen is a good young man, who comes to visit her family and Li’s family on every Chinese New Year, despite the fact that his legs make it difficult for him to walk long distances. You can say that Kong Weizhen barely escaped death. He went through 13 surgeries in all. Though he was able to keep his leg, he can no longer live like a normal person. To treat his leg, his parents suffered tremendous pain. They looked all over the place for hospitals to treat their son, their life turned upside down. 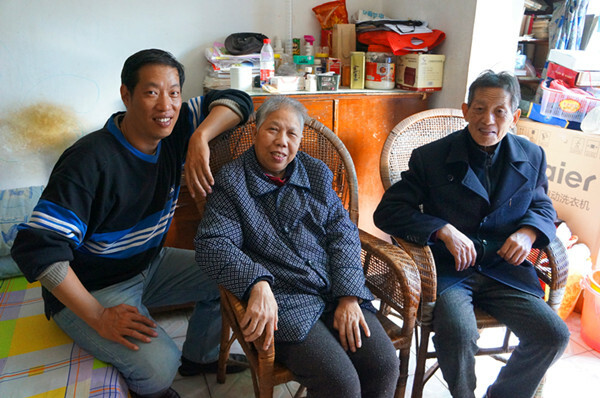 Kong Weizhen and his parents, Mr. Kong Deda and Mrs. Huang Zhifang. Qi Guoxiang suggested that we visit Kong Weizhen’s parents at their apartment. She said that losing a child is a pain that stays with parents for the rest of their lives. But the price Kong’s parents have paid to save their son is not something ordinary people can imagine. Qi Guoxiang said we should visit Mr. Kong’s parents, which would give them a little comfort. They have so much pain inside them that they have no one to confide in. We therefore left Li Xianyuan’s house and followed Kong Weizhen to his house. Kong Weizhen lives in a house allocated by his father’s work unit. The house is in a residential community that was built decades ago. The buildings are spaced very close together, like low-cost housing. Kong Weizhen does not have a regular job. He has a small stall on the ground floor of the building where he sells daily goods and makes photocopies for a living. His father used to be in the army. After he was demobilized he worked in Wuhan. I first met him at a small restaurant downstairs. Upon learning that we were coming to visit them at home, he insisted on getting two dishes from the restaurant to bring up to the apartment for us. We asked him not to but couldn’t stop him. He is tall and lean and still has the bearing of a soldier. They live on the second floor. The two larger rooms are each occupied by Kong Weizhen’s parents and Kong Weizhen and his wife. The smaller room, about four-five square meters, is where Kong Weizhen’s daughter studies and sleeps. There is no decent furniture in the house. Paint is peeling off the walls. The house is clearly in disrepair, and the family simply cannot afford to fix up the place. Kong Weizhen’s mother sits in a wicker chair, her face filled with kindness. Her diabetes has rendered her unable to walk or take care of her family. Kong’s father is the one who maintains the household and deals with the family’s daily matters. They have two sons in all. The following is an edited transcript of my conversation with Kong Weizhen’s parents, Kong Deda and Huang Zhifang, and with Kong Weizhen himself. Kong Weizhen’s parents told us that they had no idea how they lived through the years between his injury in 1989 and 1995. Mr. Kong Deda was demobilized from the army in 1986. This happened in 1989. He did not get paid by his work unit during the six months the couple spent in Beijing, so they had to be extremely frugal with everything. After coming back to Wuhan, Kong Weizhen had to have his dressing changed at the clinic at Mr. Kong senior’s work unit. And he had to continue with operations. Wuhan’s summer is extremely hot. Every day his parents pushed him in a cart to go to the clinic to change the dressing, and had to push him back home to bathe him before taking him back to the hospital. These trips back and forth were very hard work, and they had no time to take care of their younger son who was preparing to take the university entrance examination. In the end, their young son didn’t take the exam. He now works for others. Originally, they weren’t thinking of sending Kong Weizhen, their older son, to the Beijing Institute of Physical Education. But a recruiting teacher from the institute spotted him and took him in. If this hadn’t happen, his father would have gone to Shenzhen because a work unit there had decided to hire him. After his son’s injury, he was unable to leave home to go to Shenzhen. Kong Deda: “No matter what is said about it, the June Fourth massacre was an incident of the army using tanks and machine guns to crack down on the unarmed students and common people. Even Chiang Kai-Shek [President of the Republic of China] didn’t do that kind of thing. Deng Xiaoping—using these means to deal with the students—was much too cruel! How did the Communist Party get started? They got started with student movements. They said Chiang Kai-Shek massacred people. Weren’t they doing the same thing? When I was in Beijing, I saw, with my own eyes, bullet holes everywhere in the streets of Beijing. The entire road was later repaved. After talking with his parents, Guo Liying stayed with them while I began interviewing Kong Weizhen in another room. Kong Weizhen: “I participated in the June Fourth Movement: in the student demonstrations and in the activities in Tiananmen Square, the collective activities of the students. Our starting point was for the good of the country. After seeing how unfair and corrupt the society was, we students—hot-blooded young people—of course would stand up and fight against social injustice. I think there was nothing wrong with the student movement of that year. Afterwards I thought: Why were we so full of indignation? The answer is that it was the result of the education by the Communist Party, which affirmed the May Fourth Movement of 1919. From very young, we were taught that only the Nationalists [which the Communists overthrew in 1949] resorted to violence in cracking down on students. I never thought that the Communist Party would do the same. The Communist education is all a lie. It is an education designed to keep the people ignorant. “Let me tell you how I was injured. I had stayed in Tiananmen Square for some time. My father came to Beijing during his business trip to Beidaihe. He asked me to go back to school to meet him. Then I didn’t return to the square. I stayed at the school. In the evening of June 3, I heard that the troops had entered Beijing. I got on my bicycle and rushed to the square. When I got to Fuxingmen, the troops were passing by and I couldn’t go further. I put down my bike and hid along the street. When the troops passed through, they were led by tanks and armored vehicles. Motorcades full of soldiers were flanked each side by soldiers holding machine guns. On the Fuxingmen overpass, there were some roadblocks. One bus was parked crosswise in the middle of the road, but one push by the tanks and armored vehicles and the bus was overturned. Kong Weizhen: “I can’t say that I didn’t. There may be people who threw bricks, but not where I was. I was at a corner. There was a construction site on the sidewalk. The side facing the street was blocked with thin boards. I hid on the inside with many others. The soldiers couldn’t have seen us from outside. When I was shot, everyone was scared and ran away. It seemed that I heard someone next to me screaming; maybe someone else was also shot. But I couldn’t see. “I saw that I was shot in my calf. The bullet entered from the front, and left a hole in the back with bits of broken bones that felt like powder when I touched them. The arteries were torn and blood was gushing out. At school, I had learned a bit about dealing with medical emergencies and knew that if I did nothing in this case, I would lose all my blood within five minutes. So I took off my pants to tie up my wound to stop the bleeding. In the meantime, the shooting went right on nonstop. Bullets hit the ground in front of me in a stream of fire. If I were shot again, I would have been dead for sure. I started to yell for help. Some of those who were scared away came back and dragged me away and took me to the hospital on a flatbed tricycle. 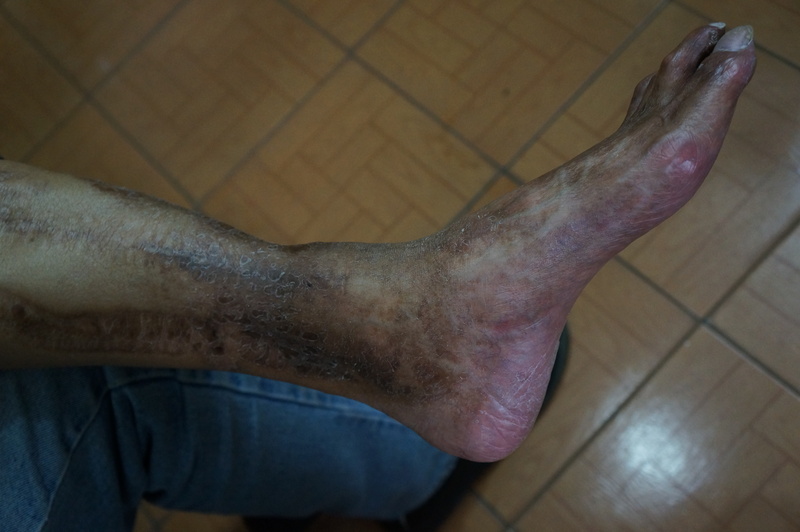 Kong Weizhen told me that in the operations, they had to take a piece of the ilium bone from his pelvis for grafting in his calf, a piece of flesh from his abdomen to fill the hole left by the bullet, and skin from his thigh for grafting. Within two years he had a total of 13 operations. But they were all unsuccessful, regardless of whether using his ilium bone or artificial bones to set the fracture. The primary reason was the lack of blood supply. When two arteries were torn by the shot, blood circulation was disrupted. His tibia couldn’t be set. Now he can only use his other calf bone, the relatively thin fibula, to support his body weight. He also showed me the scars of the big and small incisions on his stomach, and on his inner and outer thighs. These were all done to keep his calf. During the operation he almost died due to an allergic reaction to penicillin. This resulted in swelling all over his body and eventually a layer of skin was shed. The allergic reaction was triggered by an impurity in the penicillin. After that he could never use penicillin again. Kong Weizhen: “After I was injured and was about to have the operation, the school sent two people to the hospital to ask me—everyone must go through the process at the time—in great detail when I left the school, and where I went, and how I got my injury. I told them the truth. It was clear that I was accidentally injured. But the school never issued any conclusion. “After June Fourth, I had a two-year leave of absence from school. Two years later, I returned to school. I majored in basketball and was supposed to graduate in 1991. But when I returned to school, I was placed with the class graduating in 1993. I received a diploma and a bachelor’s degree. But they were of little help in my finding a job after graduation. My parents went to the school to ask for help. But because I was injured during June Fourth, the school couldn’t help me with getting employment. I had to find my own way to make a living. Kong Weizhen felt that because of the June Fourth issue, there was no way for him to have a career in the sports field. He quit sports. He has done business, worked as a coordinator in a residential committee, and now runs the small store. No matter what he does, he does really well. He was selected as an Excellent Coordinator and one of the “Top 100” in his community. But because of June Fourth he can’t pass a background check, and therefore can’t rise much higher in his career. This is an obstacle in his life that he can’t overcome. At Li Xianyuan’s house, Qi Guoxiang told us that Kong Weizhen’s parents found him a girl from the countryside to make sure that he will have someone to take care of him after they pass away. Now his wife goes out to work for someone else every day. All human beings are born free and equal in dignity and rights. Everyone has the right to life, liberty, and security of person. These are articles 1 and 3 of the United Nations’ Universal Declaration of Human Rights. The world is a great commons. People of all races have the right to enjoy freedom they are endowed with by life. No party or regime is allowed to randomly trample on or deprive them of it. The Communist Party rules the country by dictatorship. The political pattern of “whoever obeys me will prosper and whoever goes against me will perish” will be smashed. The future China will be a democratic society. Building a civil society where the country is run by the rule of law with a good social order is the trend of the world and of history. Fang Zheng, a student at Beijing Academy of Physical Science in 1989, was among the last group of students who left Tiananmen Square in the early morning of June 4, 1989. A tank ran over him, crushing both of his legs and dragged him for a distance. His legs had to be amputated. He became an outspoken critic of the crackdown. The May Fourth Movement (1916-21), also known as the New Culture Movement, was aimed at advancing national independence, emancipation of the individual and rebuilding society and culture. It was named after the student demonstrations in Beijing on May 4, 1919, in protest of the Chinese government’s weak response to the territorial concessions from China stipulated in the Treaty of Versailles at the end of the First World War. Beidaihe is a summer beach resort town near Beijing. Citizens who have made outstanding contributions to the community. Kong Weizhen (孔维真), a second-year student at the Beijing Institute of Physical Education (北京体育学院). 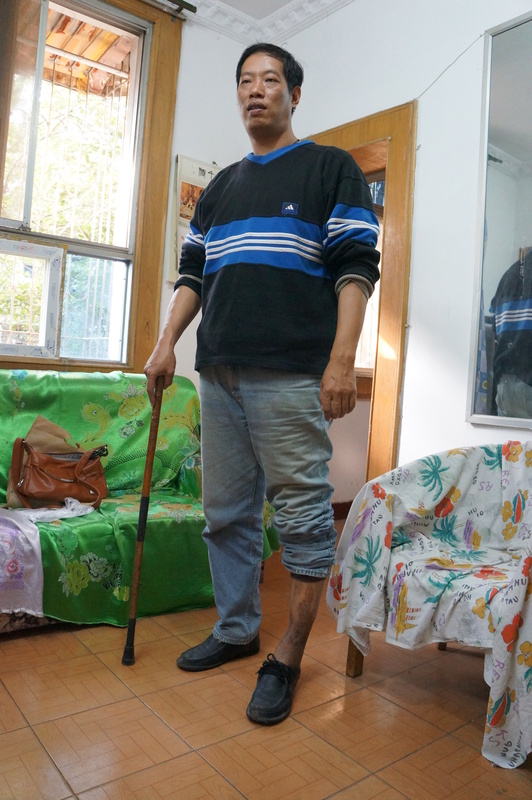 In the evening of June 3, 1989, while he was hiding behind a barrier in a construction site near Fuxingmen, a bullet shattered the shinbone in his left leg and tore the arteries. He underwent 13 operations.